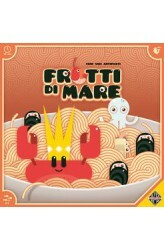 Seafood and spaghetti — a deadly combination bound to give you a delicious taste of war. At the head of the army stands the great and honorable King Crab, commander of vast seafood armies, breaker of chains, and inspirational leader in the most dire of times. The ranks of your army consist of a nicely balanced mix of Mighty Mussels, Cunning Calamari, and Shy Shrimps, topped with some Smoking Salmon and Loyal Lobsters. Frutti di Mare: Veni, Vidi, Antipasti! offers a wide pallette to satisfy every taste. In the game, players take their turn in clockwise order, and each turn consists of three phases: Income Phase — gain coins to spend in the recruitment phase Recruitment Phase — buy fresh Frutti to strengthen your army Action Phase — move and attack wi..